Ganglion cysts are swellings that most commonly develop along the tendons or joints of the wrists. They can be found either at the top or palm side of the wrist, or at the end or base of a finger. Ganglion cysts are noncancerous fluid-filled sacs that do not spread to other parts of the body and are usually harmless. It develops out of a joint like a water balloon on a stalk and contains a clear fluid or jelly material. Although the exact cause of a ganglion cyst remains unknown some theories suggest that small cysts are formed when trauma damages the tissue of a joint, or occur because of a defect in the joint capsule (tissue covering the joint) or tendon sheath (tunnel through which tendons pass) that causes the joint tissue to bulge. 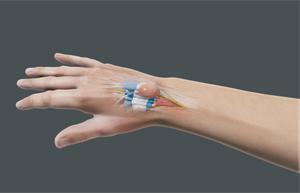 Ganglion cysts may develop suddenly or gradually over time, vary in size, and may disappear and reappear later. They may or may not be painful. If painful, the pain may be continuous and worsen with the movement of the joint. If the cyst is attached to a tendon, you might feel weakness in the affected area, or if it compresses a neighbouring nerve, you may experience a tingling sensation, pain and muscle weakness. Some may be a cause for concern because of the size and appearance. Your doctor will diagnose a ganglion cyst with a physical examination. The diagnosis is confirmed by needle aspiration or ultrasound. Needle aspiration is a process where some amount of the fluid in the cyst is withdrawn using a sterile needle and sent for examination to the laboratory. An ultrasound imaging can reveal whether the lump is solid or fluid filled (cystic), or if an artery or blood vessel is involved. X-ray and magnetic resonance imaging (MRI) of the wrist may also be employed to diagnose ganglion cysts. In many cases, these cysts may disappear without any treatment. Large cysts can be treated with aspiration where the cyst is drained of the fluid using a needle. After aspiration, an anti-inflammatory steroid is injected into the empty cyst and a splint is placed to immobilize the area. If the cyst becomes painful or limits your activity, causes numbness or tingling of the hand or fingers, your doctor may recommend surgery to remove the ganglion cyst.